I have a soft spot for traditional Easter decorations, and I have plenty of ceramic Easter eggs and fluffy little bunnies to prove it. 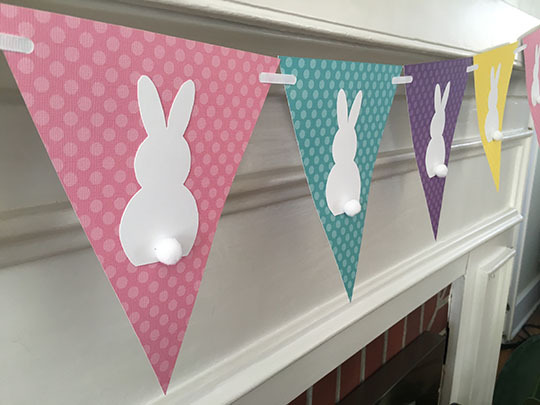 But it’s nice to do something different every now and then and make some more grownup crafts for Easter and other holidays. And since I liked the 3D Heart Shadowbox I made for Valentine’s Day so much I recreated it, this time with Easter eggs. Make sure the paper you’re using for the eggs has a design or color on both sides, as you’ll see both the front and back of the shapes when the hearts are assembled. Remove the backing from the frame and cover it with a sheet of scrapbook paper. My frame had a velvet background attached to a sheet of styrofoam. I peeled the velvet off and used double-sided tape to hold the scrapbook paper in place. Mark a light pencil line down the center of the paper horizontally and vertically. Print out the pattern for the eggs here. Cut out the patterns and trace them onto the double-sided scrapbook paper. Each egg has four pieces, so you’ll need a total of 36. Stack the egg pieces together with the largest egg on the bottom. Mark a line down the center of the smallest egg and paperclip the layers to hold them in place. Set your sewing machine for a long stitch and sew along the center line each stack of egg shapes, attaching all the layers together. The paper is stiff and the feed dogs may not grip it. If it wants to stick, you’ll need to give the paper a little push to keep it moving as you sew. 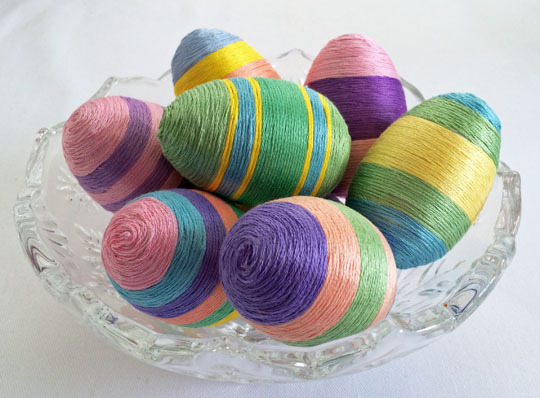 Clip any stray threads and fold the top three egg shapes in each stack to the center along the stitching line. Leave the bottom egg flat. 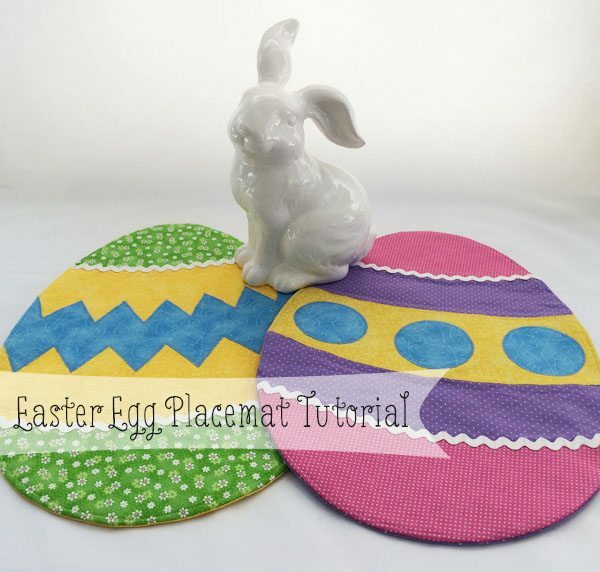 Line up the eggs using the center lines you marked on the background paper as a guide. Use double-stick tape on the back of the flat hearts to hold them in place. Place the backing back into the frame. All done! This is such a cute idea! I would love to make this for Spring! This is such a cool idea for a decoration! I don’t decorate very much for Easter. But, this looks like it’d be perfect for my home. I actually just did a post on how amazing shadow boxes are. They’re so perfect for so many crafts. Love it! Very nice idea. They pop out and stand above to shine! Hi Pam – I love this project! Visiting from Welcome Home Wednesdays and pinning! Hope you’re having a wonderful week! Super cute as always Pam! I love visiting you site and seeing your projects. 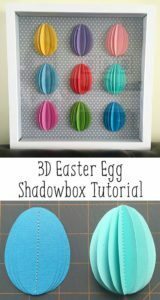 Your 3d Easter Eggs turned out as cute as your 3d hearts! Thanks for doing all the work and sharing it with us! 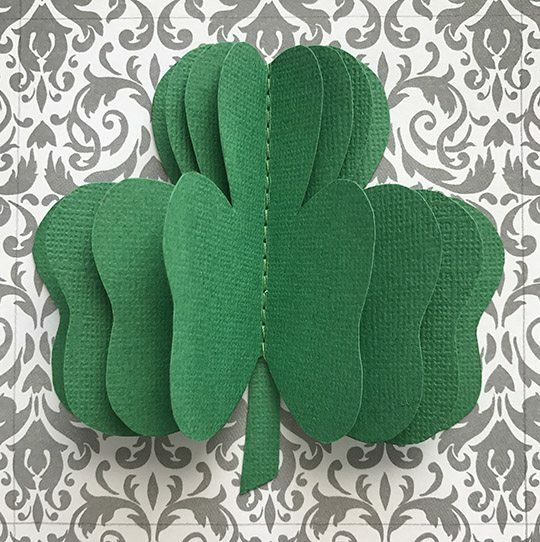 I love simple and inexpensive crafts like this. Thanks for partying with us at #TALENTEDTuesday! I have a shadowbox that I bought on clearance and never did anything with it…this is such a cute idea! Thanks for linking up at Welcome Home Wednesdays! I wasn’t thinking when I made the Valentine’s Day version and mounted the scrapbook paper directly to the backing board. When I made this one, I didn’t want to take the previous version apart so I bought a piece of gator board and used it for the backing. It was easy enough to switch out; now I just have to figure out how to store them.